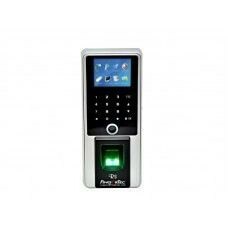 R3 is the latest biometrics door access and time attendance product from FingerTec, which combines modern technologies, great design and amazing functions in one. This machine features an eye-catching 2.4” color LCD and intuitive touch-panel; made robust to stand the wear and tear of everyday use. Multiple methods of verification which include fingerprint, card and password are available in R3, providing convenience at its best to busy users. The product comes bundled with Ingress, the perfect door access solution that is loaded with great door access features and comprehensive time attendance features, all without additional charges. With R3, life gets more exciting and secured with keyless door access solution for your life’s convenience.